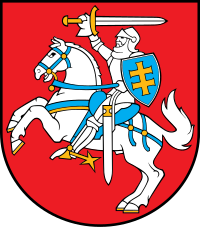 The coat o airms o Lithuanie, consisting o an airmour-clad knight on horseback hauldin an olden swuird an shield, is an aa kent as Vytis ("the Chaser"). The Lithuanian coat o airms is ane o the auldest naitional coat o airms in Europe. Airticle 15 o the Constitution o Lithuanie, approved bi naitional referendum in 1992, stipulates, "The Coat o Airms o the State shall be a white Vytis on a red field". Heraldic shield features the field Gules (red) wi an airmoured knight on a horse salient Argent (white). The knight is holding in his dexter haund a swuird Argent abuin his heid. A shield Azure hangs on the sinister shoulder o the knight wi a dooble cross Or (yellow) on it. The horse saddle, straps, an belts are Azure. The hilt o the swuird an the fastenin o the sheath, the stirrups, the curb bits o the bridle, the horseshoes, as well as the decoration o the harness, are Or (gowd). Gules, a knight airmed cap-à-pie mounted on a horse salient argent, brandishin a swuird proper an maintainin a shield azure chairged wi a cross o Lorraine Or. Wikimedia Commons haes media relatit tae Vytis.